A $1 million grant from the James Irvine Foundation will double the reach of the free public wireless Internet system in Balboa Park, making it one of the largest and fastest free public WiFi spots on the West Coast, Mayor Kevin Faulconer and City Council President Todd Gloria said Wednesday. 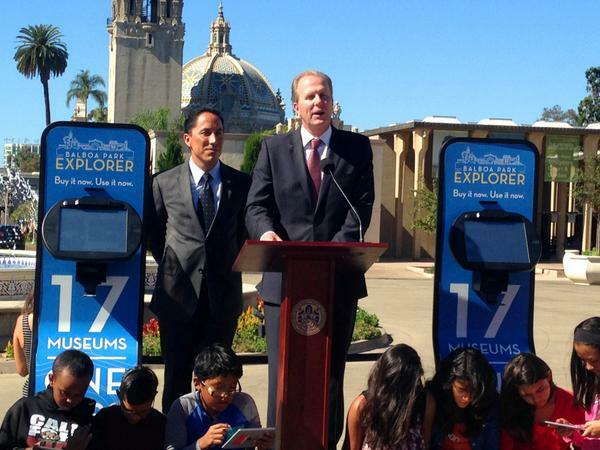 In addition, the grant will support a new initiative to use interactive kiosks and smartphone apps to enhance the visitor experience at Balboa Park as it approaches its 100th birthday, they said. The coverage area for Balboa Park’s existing WiFi network will be expanded to roughly 250 contiguous acres, ensuring reception in outlying parking lots, gardens and the West Mesa, as well as the various cultural attractions in the park. “This substantial upgrade to Balboa Park’s wireless network, coupled with other visitor-centered projects, will provide greater access and engagement to park institutions for San Diegans and other patrons,” Gloria said. City officials said the smartphone app will enable self-guided tours of the park. The kiosks will allow patrons to purchase or renew their Explorer Pass, which provides entrance to park institutions. The city was already working on installing better lighting and making 10 buildings in the park more energy-efficient. Other improvements that aren’t high-tech include a restoration of pipes at the Spreckels Organ Pavilion, putting in better signage and fixing up the Botanical Building. Planning for the celebration was interrupted earlier this year when a volunteer group was unable to attract major sponsorships. The group subsequently folded amid some accusations of wrongdoing. A recent City Auditor report cleared the group’s members of the allegations. The city now oversees the centennial planning, which is being handled by the Balboa Park Conservancy and Balboa Park Online Collaborative.